Make the bacon in a skillet or frying pan. Once browned and crispy remove from pan and drain on paper towel - dice. You can also substitute prociutto if you want something a little saltier. I prefer all-natural Seven Bridges Farms bacon. Wash 2-3 stalks of Thai basil and shake to remove excess liquid, remove the leaves from the stems and chop the leaves and flowers finely. Set aside. Shake then open a can of Polar Coconut Milk (other brands may work, but polare is the best. Stir to make sure all solids are mixed in. Clean and Eye the potatoes (but do not peel) and place in a bowl larger than the potatoes, with room for additional ingredients and cover. 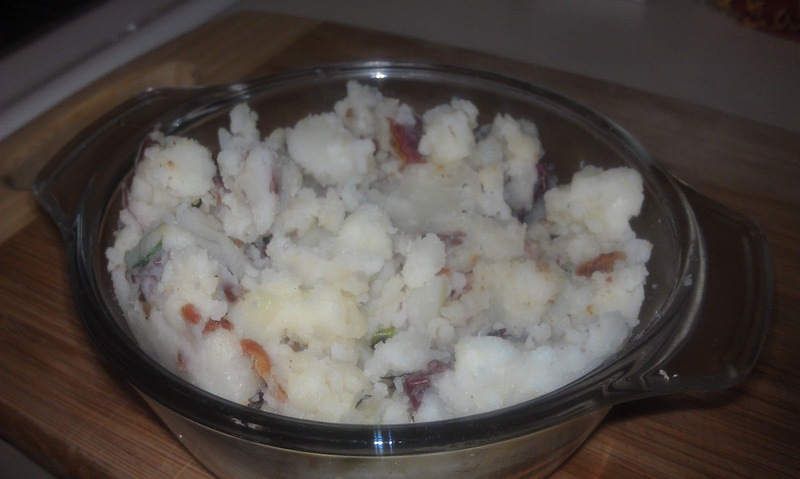 With a potato masher, mash the potatoes until the skins are broken and they are in chunks, but not completely mashed. Salt and pepper to taste - it's important that you TASTE as you do this. I use ground sea salt and a peppercorn mix for the pepper. Add a bit, taste, add more until you get the right amount. This will be bland without enough salt and pepper. Serve hot. You will not need or want sour creme, this has a subtle sweet coconut flavor (like Thai coconut rice). Copywrite 2019 Lee Drake. Picture Window theme. Powered by Blogger.